The closest beach is 50 m away. 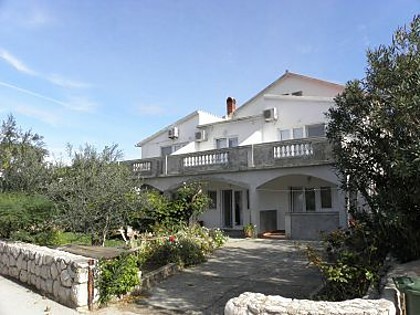 The property is 50 m away from the coast. The town center is 500 m away. Grocery store - 500 m. Closest restaurant - 500 m. Closest infirmary/hospital - 1000 m. Closest public transport (bus etc) - 600 m. Airport - 44 km. Train station - 44 km. Ship / ferry port - 44 km. National park - 58 km. Instant booking unit Apartment type: A1. The apartment has 3 bed/s for adults. There is/are 2 extra bed/s. Capacity (adults) is (3+2). It has 1 stars. Apartment has 45 m2. It is on the first floor. Number of bedrooms: 1. Number of bathrooms: 1. Number of balconies: 1. Flooring in the bedroom tiles. In the room is double bed. In the room is one single bed (for one person). Bedding is available to guests., The room has an exit to the balcony. The living room has an exit to the balcony/teracce, there is one double bed in the dining room, separate Kitchen. Flooring: tiles. The bathroom has 6 m2. Equipped with: shower, toilet, tiles. Balcony/teracce of the apartment has 10 m2. Features and equipment: seating set, partly covered, orientation park side, garden view. Balcony/teracce of the apartment has 2 m2. Seaview, garden view, studio apartment orientation sea side. Bathroom has 6 m2. Equipped with: shower, toilet, tiles. Balcony of the studio apartment has 8 m2. Features and equipment: seating set, partly covered, orientation sea side, seaview, garden view.